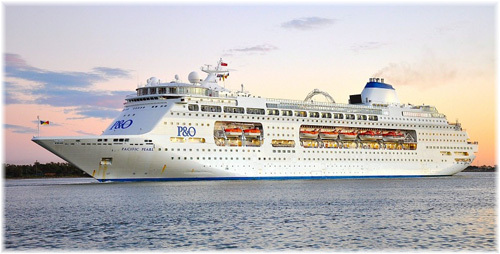 Today, Cruise & Maritime Voyages announced the acquisition of a new flagship, in P&O Australia’s Pacific Pearl, which had catered to many UK passengers in the past and will be based in Tilbury from next summer. The latest acquisition will be named Columbus, which also happens to be the name of one of the bars on the line’s veteran Marco Polo. 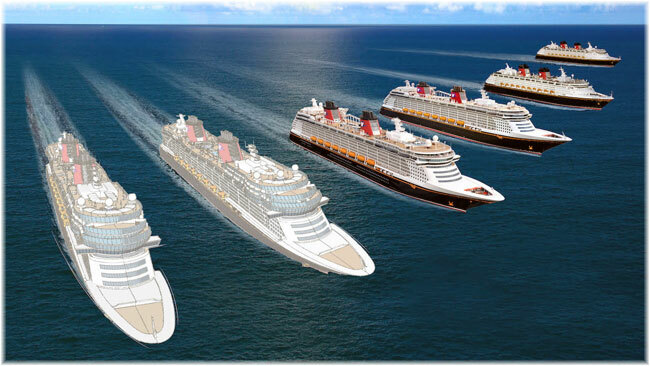 Last week, Disney Cruise Line announced that it would be building two more cruise ships at Meyer Werft in Papenburg. And Royal Caribbean International’s Anthem of the Seas, the largest cruise ship operating in winter weather fro New York, suffered one more itinerary change. 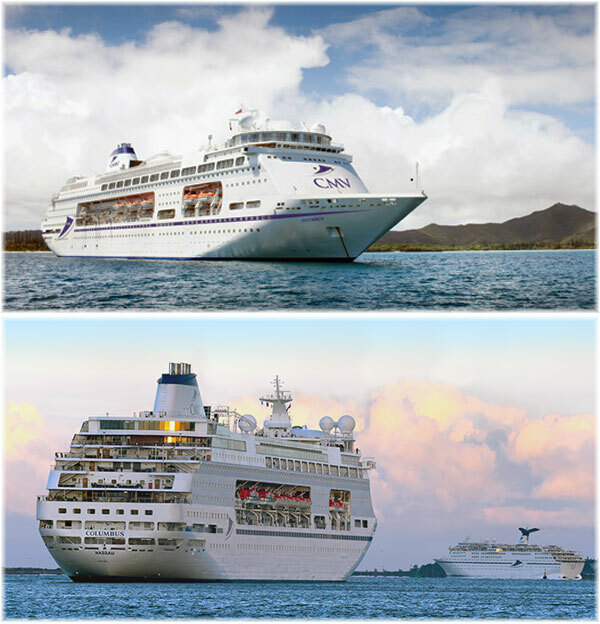 Cruise & Maritime Voyages (CMV), announced today that it would be adding the 1,400-berth Pacific Pearl from P&O Cruises Australia to the its cruise fleet, to begin cruise operations on Friday June 9, 2017 as their Columbus. Under the line’s explorer theme, the Columbus will be dedicated to the British cruise market and sailing year round from London Tilbury and providing a more traditional scenic British cruise experience. She will carry mainly British passengers accommodated in 775 cabins, including 150 singles, and will become the newest flagship of the CMV ocean fleet, where she will join the 1,300-berth Magellan, 800-berth Marco Polo, 600-berth Astor and 550-berth Astoria. Columbus will also be directed at the adult-only (16 years plus) market although in summer 2017 she will operate two selected August summer holiday sailings for all age groups. The ship was launched in 1989 and christened by actress Audrey Hepburn on March 23. Christian Verhounig, CEO and Chairman of CMV said: “The successful introduction of Magellan in 2015 has encouraged our Group to accelerate their mid-term growth plans and the addition of Columbus to the fleet is another important milestone in achieving our longer term growth objectives”. He added, “the strategic development of the Group’s presence in the UK and wider international markets will increase our overall capacity to 125,000 passengers in 2017. “We are proud of the CMV brand’s growing international recognition and remain confident in continuing to successfully build our business as a strong value based ‘independent’ alternative and deliver profitable returns for both our trading partners and stakeholders”. 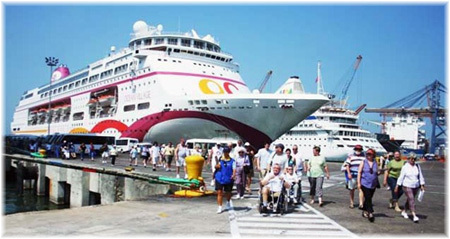 “The introduction of Columbus and her past association and popularity with the British cruise market as Arcadia and then Ocean Village, will increase 2017 berth capacity by 25% to 95,000 passenger nights. Having already sold over 85% of capacity for 2016 and with 17,000 people turning 50 every week in the UK, we remain confident that Columbus will satisfy the growing demand for our product”. The Walt Disney Company has announced plans to build two more ships, continuing its theme of family entertainment, storytelling and the kind of service that only Disney can deliver. The company has entered into a memorandum of agreement with the Meyer Werft shipyard in Papenburg calling for the new ships to be completed in 2021 and 2023. The new ships will measure approximately 135,000 gross tons – slightly larger than the Disney Dream and Disney Fantasy, and each will have about 1,250 guest staterooms. Final design plans, names and itineraries are still in development. Since first sailing in 1998, Disney Cruise Line has provided an essential family cruise holiday experience that combines the magic of Disney with exploring different parts of the world. Guests sail aboard majestic and beautiful ocean liners and enjoy legendary Disney entertainment, exquisite dining, spacious and well-appointed staterooms and expansive public spaces. 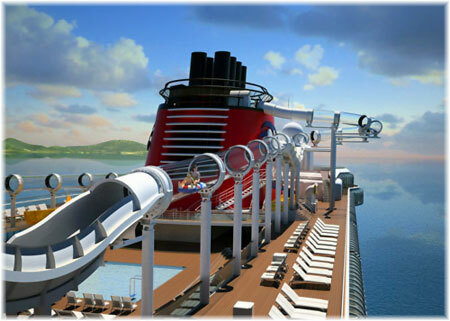 With the launch of the Disney Dream and Disney Fantasy in 2011 and 2012, the company introduced several firsts for the industry, including a water coaster at sea and virtual portholes in interior staterooms that provide real-time views of the sea as well as sightings of animated Disney characters. The expansion of Disney Cruise Line adds to the unprecedented growth taking place across the Disney product, from Star Wars experiences coming to the Walt Disney World and Disneyland resorts to the 25th anniversary of Disneyland Paris and the grand opening of the new Shanghai Disney Resort. An Atlantic Ocean storm forced Royal Caribbean International to make another itinerary change for its New York-based 4,180-berth Anthem of the Seas last week. This was the third itinerary change for the ship since she hit a winter storm off Cape Hatteras in early February. The Anthem was scheduled to make a 3-night cruise out of Bayonne NJ with a call in Nova Scotia. However, due to the storm the ship will now stay at sea for the entire cruise. Instead of north, the ship headed south when she sailed on Friday, heading for the Atlantic coast of Virginia. Passengers on board posted videos showing calm and sunny seas. Only last week, the Anthem returned to Bayonne two days early in order to avoid another storm off Cape Hatteras. Unlike earlier years, when winter cruise ships sailed from New York and were buffeted by heavy weather off Cape Hatteras, and sometimes had to skip ports in the Caribbean due to weather delays, a new policy at Royal Caribbean International will avoid storms. Royal Caribbean’s Miami office now coaches its masters on weather conditions, giving guidance to captains as to where to find the best weather, in a system not dissimilar to the weather routing programs that are used by cargo ship owners to avoid cargo damage.